174 000kg – The total weight of the waste that has been redirected from landfill by TWTC’s Schools Recycling Project in the last term of 2015. “The schools have worked very hard, and have been taking the recycling project very seriously. This is apparent in the number of assembly talks already booked for this year, our first term is almost fully booked with activities! "- Emmy Nxayeka, Schools Project Coordinator, The Waste Trade Company. Kabega Primary once again takes the lead with a total weight of 10954kg! Dr Adele Botha, who is the driving force behind Kabega's Groenspoor prefects, has set a stellar example of how to run a recycling programme at school. "Recycling has become an extracurricular activity at school, and we have a waiting list of prefects that want to be a part of this programme" - says Dr Botha. 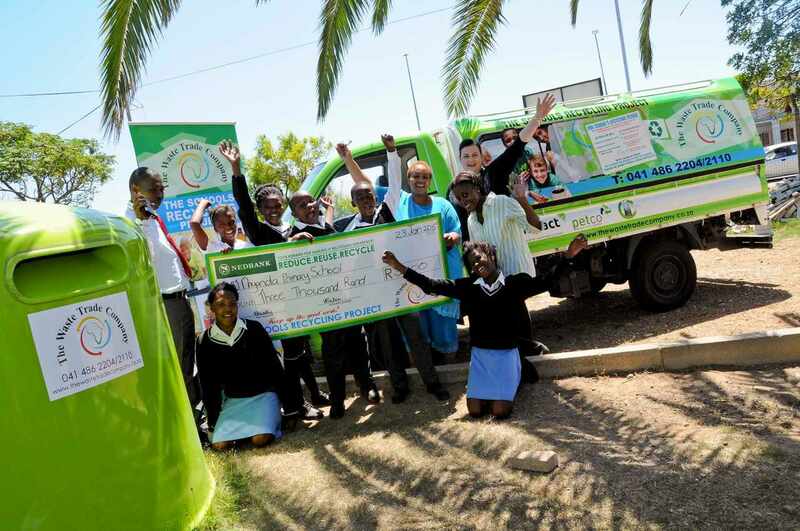 The new Groenspoor prefects were very happy to receive a R3000.00 cash prize, donated by Mpact Recycling. Schools are encouraged to form enviroclubs, who are the driving forces behind the success of a recycling programme. Companies are also welcomed to donate their recycling to a school of their choice. Furthermore, the public can drop off their sorted recycling at Total Garage in Admiralty Way, or Walmer Methodist Church in 7th Avenue, Walmer.